Many people neglect having an eye exam but this is not good. First, a person may have adjusted to vision problems that could be corrected with glasses or contacts. Those with glasses might need an adjustment in their lenses to make their vision more natural. But it is also true that serious eye problems can often be detected and corrected because of regular eye checks. The good thing about eye exams is that they are relatively painless. To whom should someone go for a Lasik eye exam? An ophthalmologist (from the Greek word for eye) is a medical doctor who can treat both vision correction and complex eye diseases and problems, including surgery. An optometrist is able to test and prescribe corrective lenses and also to detect and treat common eye disorders. However, he will refer more serious eye problems to an ophthalmologist. An optician is able to fill prescriptions for eyeglasses and often contact lenses as well. They will get the prescription from the eye doctor and fill the order, much as a pharmacist does with a medicine order from a doctor. Usually an eye exam will consist of two parts. A patient will go into the office and the doctor or technician will check for obvious eye problems. This may involve reading the letters projected onto a screen as well as asking questions about his visual history. It is very important that the patient is honest and does his or her best on these tests so the doctor will be able to correctly evaluate his vision. Often at this point someone will put drops of a clear liquid called atropine into each eye and the patient will be send to the waiting room for twenty to thirty minutes. This dilates the eyes and allows the doctor to study the inside without the pupil closing in the presence of bright light. When the parent returns, he will be given several tests. An eye muscles test will assure that the patient does not have a ‘lazy eye’, that is, one that does not track in synch with the other. The Visual acuity test measures how clearly the patient can see from a distance, usually about twenty feet. The letters get smaller until the patient is unable to distinguish them. Along with this, a refraction assessment will determine if correction is needed and, if so, what degree of correction would be most useful. The doctor will ask which of two options allows him to see more clearly. If the patient is nonverbal or, for some reason, unable to read the letters, the doctor may use a technique called retinoscopy. The doctor measures the focus of the light on the retina with various corrections and determines what lens may be needed. The patient’s visual field will also be tested. This determines peripheral vision, i.e. what he can see without moving his head. The session may also include a Slit-lamp examination to check the cornea, iris, lens and anterior chamber of your eye. Perhaps a red dye called fluorescein will be used to highlight any defects in the cornea. 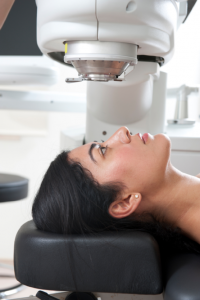 While the eye is dilated, the doctor will want to examine the back of the patient’s retina to be sure nothing is amiss. A cloudy lens may indicate the present of cataracts. The final test covered here is the glaucoma test or tonometry. Glaucoma is caused by excessive pressure within the eye. Thus this set of tests measures the amount of pressure in the eye. A puff of air will test pressure on the cornea. The thickness of the cornea may also be measured. This is called pachymetry.